It is extremely unusual for creationist research to be favorably reported and referenced in a technical scientific paper by academic geologists published in a major, secular, geological journal. However, not only has this just happened, but the same paper reported experimental research that confirms the conclusions of the creationist research published in a young-earth creationist journal! Snelling (1995) reviewed previous laboratory experiments, silica deposition of wood at Yellowstone National Park and various reports of natural petrification, and concluded that wood can be rapidly petrified by silicification under the right chemical conditions. the timeframe for the formation of the petrified wood within the geological record is totally compatible with the biblical time-scale of a recent creation and a subsequent devastating global Flood. The experimental research conducted by these five Japanese scientists was located at the Tateyama Hot Spring in the Toyama Prefecture of central Japan (figure 1). A hot spring lake 30 meters wide occupies one of several explosion craters of the Tateyama Volcano, which currently is relatively quiet, except for the spouting of hot water. The lake's average water temperature is approximately 70°C. The spring water spouting from the lake bed is highly acidic (pH 3) and has a high silica content. This has resulted in the precipitation of opal around the lake's shoreline. Scanning electron microscope (SEM) examination of this opal reveals that it consists of an irregular arrangement of silica spheres of different sizes. Figure 1. 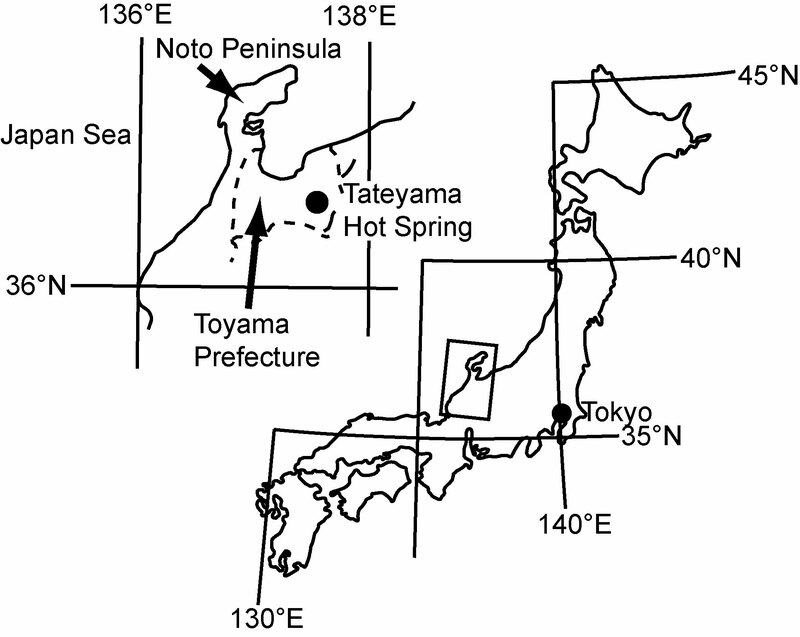 Map showing the location of the Tateyama Hot Spring in central Japan. The hot spring water overflows the lake as a 30 meter high waterfall. Abundant fragments of naturally fallen wood from nearby trees have adhered to the rocky wall of the waterfall, becoming impregnated with silica and hardened (somewhat petrified). This silicification obviously has resulted from the precipitation of silica spheres onto the cell walls in split surfaces of the fallen wood. Akahane and his fellow Japanese scientists observed that the textures of these wood tissues are the same as those in naturally silicified (petrified) wood found associated with volcanic strata in the geologic record, such as the Miocene sedimentary and volcanic ash strata of the nearby Noto Peninsula. They thus concluded that these naturally silicified wood fragments in the geologic record would seem to have been petrified by the same process under the same conditions as the wood fragments in the hot spring water. To confirm the silicification process involved and to evaluate the silicification rate, ex-periments were undertaken. Ten pieces of fresh alder wood (Alnus pendula Matsumura), indigenous to the area, were tethered with stainless steel wire and placed into the hot spring water stream on August 28, 1990. Specimens were removed after one year (August 27, 1991), after two years (July 21, 1992), after four years (August 25, 1994), after five years (September 2, 1995), and after seven years (October 3, 1997). The hot spring water at the experimental site maintained a temperature of 50-52°C and a pH of 2.95-3.0 throughout the whole experimental period. Both these experimental wood specimens and the silicified naturally fallen wood fragments were then chemically analyzed to determine how much silicification had occurred in them. Furthermore, to confirm the nature of any silica impregnation of the inner part of the wood tissue, the distribution of the silica in the wood tissue of the specimens submerged in the hot spring water for seven years and some of the naturally fallen and silicified wood fragments, was studied by SEM mapping. The amount of silicification in the experimental wood specimens, measured as the silica content of the ash after the organic matter had been removed by heating the wood in an electric furnace, increased from 0.7% to 38.1% as the submerged time period increased from 1 to 7 years. Silicification during the first 1-2 years was found to be negligible (0.7-2.9%), but then increased markedly after 4-5 years to 10.7%-26.8%, and finally to 38.1% in the specimens submerged for 7 years in the hot spring water (figure 2). By contrast, four specimens of the silicified naturally fallen wood fragments had silica compositions varying from 9.7% to 39.2% of the total weight of the wood. From 14C measurements it was determined that three of these four specimens must have fallen into the lake overflow stream after 1955. Thus the silicification rate of the naturally fallen wood pieces in the hot spring water was 9.7% to 39.2% in a period of less than 36 years (between 1955 and 1991). This silicification rate would appear to be much slower than that of the experimental wood specimens, perhaps due to their likely intermittent immersion in the hot spring water, compared with the constant total immersion of the wood pieces in the experiment. A comparison of SEM photographs of the silicified naturally fallen wood and experimentally silicified wood revealed that silicification had occurred by deposition of silica spheres (2-3 µm diameter) onto the surfaces of the wood tissue (figure 3). This is consistent with the hot spring water depositing opal, made up of these same tiny silica spheres, on the lake bed and shores. Within wood tissue are vessels and intervessel pits that are passageways along which water passes. Thus Akahane and his colleagues concluded that the hot spring water containing silica spheres passed into the wood through the vessels and intervessel pits and deposited the silica spheres onto the individual cell walls, finally occupying the inside of the wood, including the vessels, cells, and fibers. Furthermore, in the Miocene petrified wood, not only were the same silica spheres found similarly deposited onto cell and vessel walls and in fibers and cells, but aggregations of silica spheres had replicated the structure of the vessel walls. Figure 2. 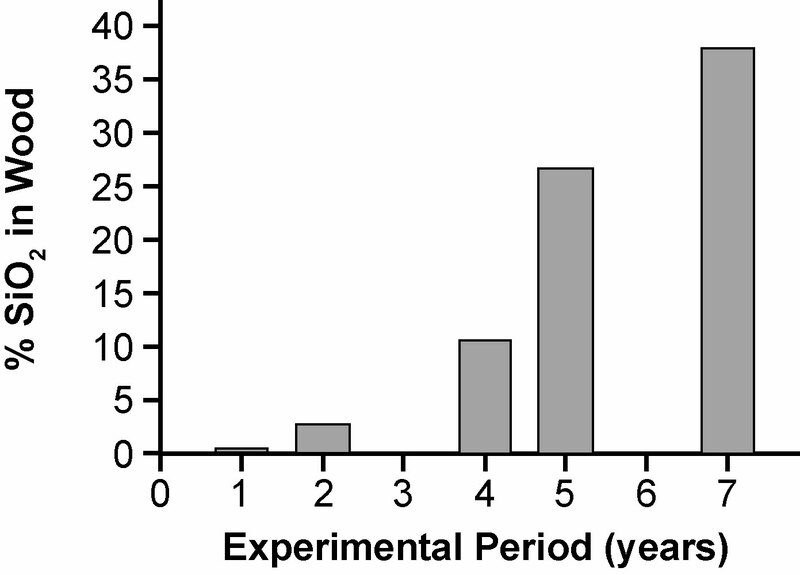 Graph showing the progress in the silicification of the wood specimens with the increasing experimental period of their submersion in the hot spring water. Akahane and his fellow Japanese scientists concluded that silicified (petrified) wood had been formed naturally under various conditions by deposition of tiny silica spheres (opal) within it. Although there had been a different rate of silicification within each piece of wood studied, at 7 to less than 36 years the silicification of the wood had been very rapid, compared with claims of several millions of years. They also concluded that petrified wood in ancient volcanic ash beds and sedimentary strata in volcanic regions could have thus been silicified by hot flowing ground water with high silica content in "a fairly short period of time, in the order of several tens to hundreds of years" by the same mechanism. Akahane, H., T. Furuno, H. Miyajima, T. Yoshikawa, and S. Yamamoto, 2004, Rapid wood silicification in hot spring water: An explanation of silicification of wood during the Earth's history, Sedimentary Geology, vol. 169, pp. 219-228. Siever, R., 1972, Silicon, in, K. Wedepohl, ed., Handbook of Geochemistry, New York, Springer-Verlag, vol. II/3, pp. 241-265. Snelling, A.A., 1995, "Instant" petrified wood, Creation, vol. 17, no. 4, pp. 38-40. Snelling, A.A., 1994, Creating opals: opals in months—not millions of years! Creation, vol. 17, no. 1, pp. 14-17. * Andrew A. Snelling, Ph.D. geology, is an Associate Professor in the Geology Department at the ICR Graduate School. Cite this article: Andrew A. Snelling, Ph.D. 2005. Rapid Petrification of Wood: An Unexpected Confirmation of Creationist Research. Acts & Facts. 34 (1).